On Thursday night we ran a Hockey Speed Development webinar, and we ran out of time to answer questions live on the webinar (because we are only given an hour with the software), so we had the hockey players and parents type in their questions and I’ve answered them below. Thanks to those who came to the webinar, and I’ve been happy to hear some great feedback! Use that information and get faster! Hockey players are notoriously tight in their hips and their whole lower body in general. But specifically within the hips, lower body, the groin, and the calf/Achilles tendon. Too often people write off mobility as simply a flexibility issue when that is certainly not always the case. For example, if you are unstable in the bottom portion of the squat, some coaches would say you need to work on your mobility. When in reality, stability is a strength associated issue. It’s not that you’re not mobile enough to get into that position, it’s just the muscles that are responsible to keep you stable in that position aren’t strong enough yet. Focusing on flexibility here would do you no service whatsoever. In another example, let’s say a female gymnast was bending over in the upper body in the downward portion of a squat. Well, she’s a gymnast, we know she doesn’t need any more flexibility, so this is more of a technical issue where she would be better off improving and mastering here technique in the squat, and not the associated mobility issues of the squat. So — first it’s important to understand that mobility is the intersection of these three qualities. Put another way, if it’s not actually a flexibility issue, don’t work on flexibility. Determine the cause of the issue and work backwards from there. But, if you are asking what’s a good way to determine when a hockey player is flexible enough to produce optimal speed levels, here’s a few guidelines. Starting with the hips, split squats are a great exercise to alleviate this issue. When you’re viewing the athlete perform a split squat and you are taking care of these priorities know that you are training the front leg for strength and the back leg for flexibility. Throughout the movement, the torso should be upright and at the bottom of the movement the hamstring should be flexible enough to be up against the calf and the back knee should be behind the hip during movement. If the athlete can go through a full range of motion using this type of technique in a Bulgarian split squat, you can be assured it’s not their hips that’s an issue. This exercise will also cover groin issues as well. 2 birds with 1 stone. Last but not least, we have the calf/Achilles tendon. Hockey players calves are simply too tight, and you need to increase their flexibility. Fascia Stretch Therapy is a great method for the calves, but if you don’t have access to this, seated calf raises with a 2 second stretch pause at the bottom of the movement really helps. If the athlete is able to stretch low at the bottom, and come all the way up to the ball of their foot, then they have good range and can achieve triple extension at the hip, knee and ankle for optimal stride length. What are your top 5 speed workouts? For more information on this check out Next Level Speed. If you’re doing sprints with a sled or parachute should your toes point forward or out a bit as you would when skating? You can check out my sprint video on the hockey training YouTube channel and I also go over this a bit in my “functional exercises to skate faster” blog post. Sprinting has got to be done with the toes forward just like you normally would for many reasons that are going to improve hockey performance. The off-season is actually the time to get away from the constant toes out position to balance out the lower body musculature and improve structural/mobility issues. Sprinting has very solid carryover to speed on the ice, don’t try and mimic skating mechanics here. What is the age range for everything talked about in the speed webinar? 14+. 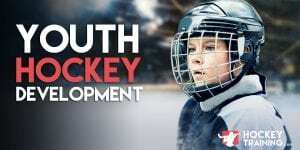 Hockey players under 14 should be checking out our Youth Hockey Training program, which will help develop speed. I do one legged snapshots on a balance board. Do you recommend I do them on a balance board or flat ground? It’s more specific to the game of hockey and you will be able to develop greater force production which over time will improve your shot much more efficiently than a balance board. Are dot drills good for agility? They are an ok addition, but they should certainly by added to a more complete agility program. Agility is 100% dependent on relative strength, decreasing amortization phase, core power, mobility and mentality. Dot drills do not address any of these qualities and therefore shouldn’t be used (for a hockey player) in agility training. It loses points right away in specificity because at no point in the game do hockey players require this type of stride length/stride frequency or neurological recruitment pattern. Just think about agility. It’s all about high velocity direction change, deceleration, absorbing and redirecting forces and exploding into different planes of movement. These are all forms of well-developed strength and power systems. The potential of your agility is limited by your strength. When you’re absorbing and redirecting forces (which sums up all agility), that’s an eccentric to concentric muscle contraction. The speed at which you can change from an eccentric to concentric contraction is going to determine how agile you are and that’s going to be governed by the above mentioned qualities. In addition to this, a more accurate definition of sport specific agility is swift movement in unpredictable environments. Dot drills are pre-determined movement patterns, it’s tough to make the argument that it’s true agility when you know what you’re doing beforehand. Do plyometric boxes increase speed? They sure can. When used properly they are a great tool for the development of speed. 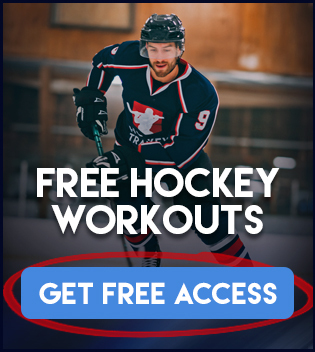 Do you have an in-season program? Yes I do! You can view it here. When you mention 20% of your body weight on the sled pulls, does that include the weight of the sled or only the added weight? Actually I said (or meant to say) 10%, not 20%. 10% is a great load to improve acceleration in hockey players and this does not include the weight of the sled. At age 7, 4′-2″ 50+lbs, what would be a good off-season target calorie amount and carb/prot/fat ratio to gain some size? At age 7 it’s not something to be concerned with. Just ensuring he gets hearty meals and is following the nutritional guidelines I discusses in the Youth Training manuals is more than enough to maximize the results. Leave the calculations to a later date, at this point in time he is like a sponge and will be absorbing not just new skills but all of that food efficiently as well. Large, square meals and making sure the breakfast isn’t just a bowl of cereal is all they will need as far as the basics go. In addition to your youth training program, would you recommend my child switch and train for power some weeks? It sounds like a great idea in theory, but youth training development is entirely about building the greatest possible foundation to grow from. The youth training plan covers all of this, I made sure to cover all bases in there for optimal results for both the short and long term. Remember power is nothing without strength, it doesn’t matter how fast one can create force production if their force production limit is low to begin with. Power need only be worked on at a later date once the strength and movement foundation is in place. Power is that “icing on the cake” we add to hockey players in their developing teen / adult years but we need that foundational cake there first. What are 3 really good speed sprints variations?